“Welcome to Jurassic Park,” an island based on the blockbuster book and movie series. 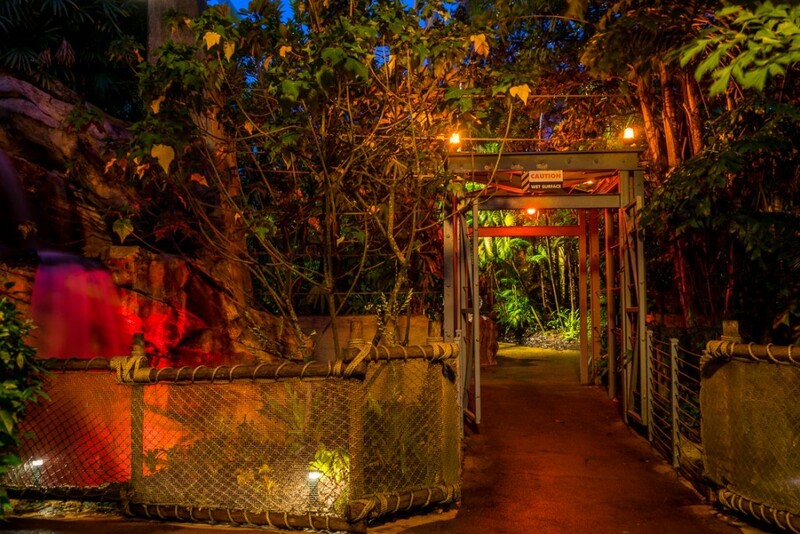 Overgrown plant life and the sounds of prowling predators greet guests who pass through the massive gateway to step into a modern take on prehistoric times. Children of all ages will love Camp Jurassic, a dinosaur-themed playground featuring caverns, water cannons, slides and climbing nets. Dinosaur fans also have the opportunity come face-to-face with a T-Rex on the Jurassic Park River Adventure. To make the visit an educational one, stop by the Jurassic Park Discovery Center, a dinosaur themed museum that offers activities for children and dinosaur replicas. Jurassic Park at Universal’s Islands of Adventure. Click any marker to display the attraction or venue name. To scroll or zoom, use the controls on the top-left of the map. You may also switch to different map views by using the buttons on the top-right of the map. The attractions and venues in Jurassic Park have a green marker.